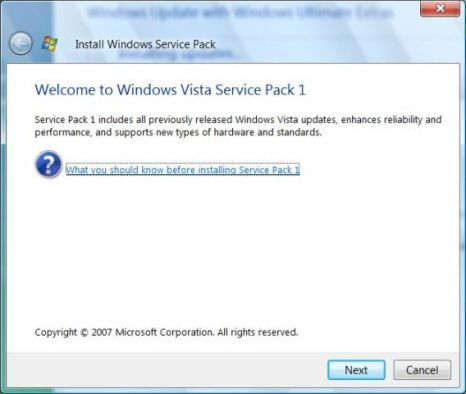 Windows Vista Service Pack 1 Release Candidate 1 has been released to Microsoft Connect, MSDN, Technet subscribers, and it’s also available for free download in Windows Update. All users need to do is to simply add in a little registry key to the Windows Vista system so that Windows Update or Microsoft Update can recognize and identify the PC as a legitimate target to install Windows Vista SP1 RC1, and shows the SP1 RC1 as one of the important updates option. 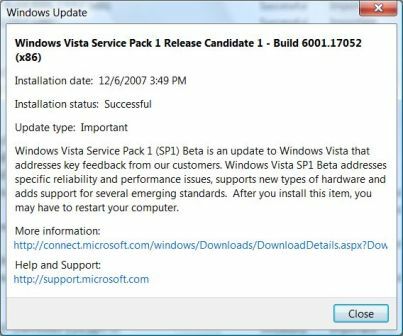 To install Windows Vista SP1 RC 1 Build 6001.17052 v.668 or upgrade from Vista SP1 v.658 or older beta online via Windows Update, simply follow the steps in the illustrative guide below. There is no need to uninstall and remove previous Beta or RC Preview of Windows Vista SP1. Download the WebUpdater registry hack script SP1RC_WUHack.cmd. Right click on the .cmd (or .bat) and then select “Run as Administrator”. After merging the registry key, open Windows Update, and click on Check for updates. Two important updates are found and required to install – Update for Windows Vista (KB 935509) – v1.008 and Update for Windows Vista (KB 938371) – v1.024. Click on Install Updates to start downloading and installing these hot fixes. Restart the computer after finished installation. Run Windows Update and click on Check for updates again. 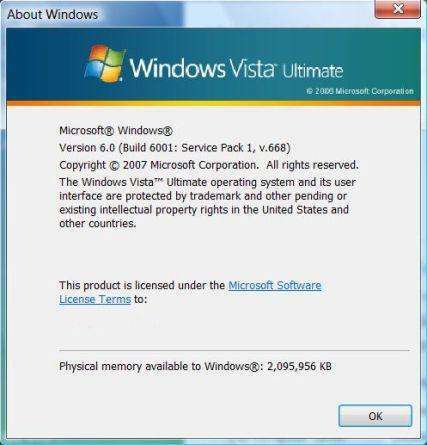 One important prerequisite important update for Windows Vista SP1 has to be installed – Update for Windows Vista (KB 937287) – Build 6001.17052 (x32) (or x64). Click on Install Updates to download and install the KB937287 hotifx. IMPORTANT: Reboot computer now. After installation of update, Windows Vista won’t asks for restart, but the system may not see Vista SP1 RC1 if not restarts. After PC boots up, go to Windows Update again, and check for updates. Voila, 1 important update with size of 51.0 MB – 539.2 MB is available for download and install. If your Windows Vista WU doesn’t show any important update available, wait for a few minutes and try again. Click on View available updates will show the update as Windows Vista Service Pack 1 Release Candidate 1 – Build 6001.17052 (x86) (or x64) published on 5 December 2007. Click on Install Update to start downloading and installing the much anticipating Windows Vista SP1 RC1 now. Windows Update will start downloading update (Windows Vista SP1 RC1). The initial download size appears 52.5 MB. But as time progress, Windows Update detects more Vista components installed on your system, and will download larger and increasing size of service pack update for Vista. So don’t expect a speedy download. 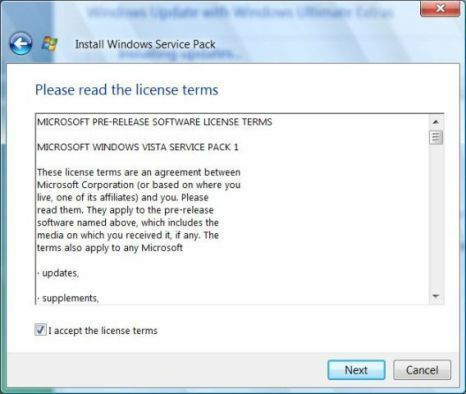 After downloaded Vista SP1 RC1, Windows Vista Service Pack 1 dialog will appear. Tick the check box for I accept license terms and then click on Next to continue. Click on Install to start installation of Windows Vista SP1 Update immediately. Windows Update now installing update 1 of 1. Installation process may take a while. The update was successfully installed. 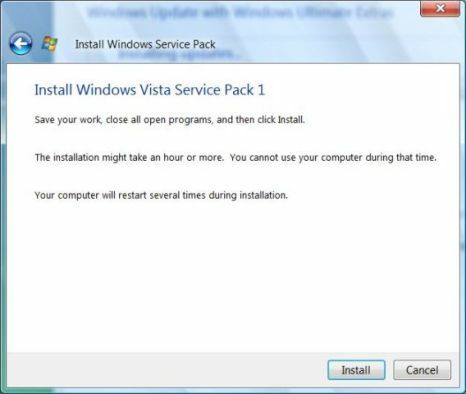 In actual, the installation of Windows Vista Service Pack 1 is still long way to go. Click on Restart now to finish installing service pack updates. There are 3 more stages of setup, where 2 stages will be done before shutting down, and final stage after system boots up before entering desktop. Once you’re logged on and back to Windows Vista desktop, Windows Vista Service Pack 1 Release Candidate 1 has been installed successfully and completely. There will be a balloon notification message pops up from system tray area to indicate that one update has been installed. You can go to Windows Update to review update history. Right click on the line of Service Pack 1 for Windows Vista and select View details, you will get to see more detailed information about SP 1. After installing Windows Vista Service Pack 1 Release Candidate 1, system properties (basic information) will display Service Pack 1, v.668.